From 85N (Norcross/Chamblee): I-85S take exit 85 (I-75N Marietta/Chattanooga), take exit 252B Howell Mill Rd, make a left on Howell Mill Rd, turn right on Defoor Ave NW (road between Waffle House and QuickTrip), turn left on Defoor Place NW, we are the building with the big orange Frenchie on the right! From I75N (Marietta/Chattanooga): Take I-75S to exit 252 (Howell Mill Rd) turn right on Howell Mill Rd, turn right on Defoor Ave NW (road between Waffle House and QuickTrip), turn left on Defoor Place NW, we are the building with the big orange Frenchie on the right! From 75S/85S (Airport): Take I-75/85N follow I-75N towards Marietta/Chattanooga take exit 252B Howell Mill Rd, turn left onto Howell Mill Rd, turn right on Defoor Ave NW (road between Waffle House and QuickTrip), turn left on Defoor Place NW, we are the building with the big orange Frenchie on the right! Dog Days’ West Midtown Atlanta location provides pet owners with a fun and safe dog day care and dog boarding environment that your dog can utilize as an outlet for energy. We believe consistent interaction and attention to dogs is vital for making happier pets. 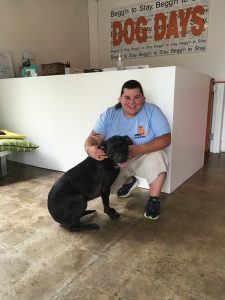 Furthermore, we believe a smaller dog daycare and dog boarding facility creates a more intimate environment, where special needs can be met and unique personalities recognized. By taking fewer dogs, we can guarantee proper supervision for each individual pet. Hope Buie is the Assistant Manager of Dog Days Atlanta's Westside location. 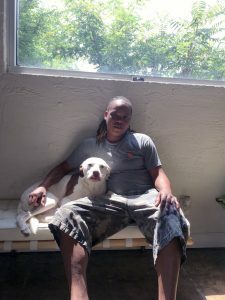 She has over 8 years of Dog Daycare experience and completed college level classes to become a Veterinary Technician. She's from Tampa, FL and has two dogs of her own - Sarge and Skye. Around here Hope is know as the Dog Whisperer. $45.00 per 24-hour period – includes day care, special feedings, administering medication, etc.